Whenever we arrive home to find a brown box on the porch my daughter is excited to find out what’s inside. The feeling is short lived. Almost all of the packages I receive fall into two categories: 1. Clothing or 2. Medical supplies. So imagine her delight when this time the package was for her! Inside was an amazing birthday package from ProFlowers. 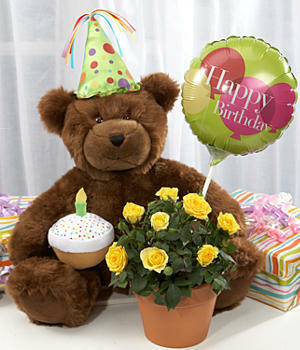 It includes a plush bear with sewn on birthday hat and cupcake, a Happy Birthday balloon and a miniature yellow rose plant. I think it was the perfect combination of items, especially for a child. The balloon was a fun touch and the bear is very soft. In my opinion the miniature flowers, while suitable for anyone, was just the perfect size for little ones to enjoy. I suppose if you are the gardening type, which I am not, you can transfer them to your garden. Since I have a notorious black thumb I like the fact that once I inevitably kill the flowers my daughter will still have the bear to remember her special delivery. 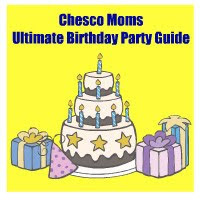 It was a great way to start her 3rd birthday! ProFlowers has items for every occasion. Not only do they have great flowers but they also have plants and a variety of gift baskets. My order was delivered quickly and packaged well. You can check out their large website here ProFlowers. **Disclaimer: ProFlowers provided the Birthday Basket in order for me to review. I was not compensated in any way for this review other than receiving free product. All opinions stated are mine.